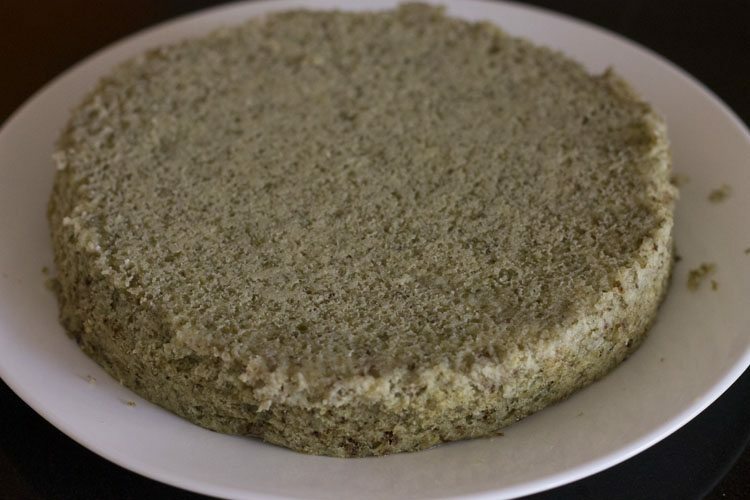 moong dal dhokla recipe - healthy, tasty and nutritious moong dal dhokla - a popular gujarati snack. 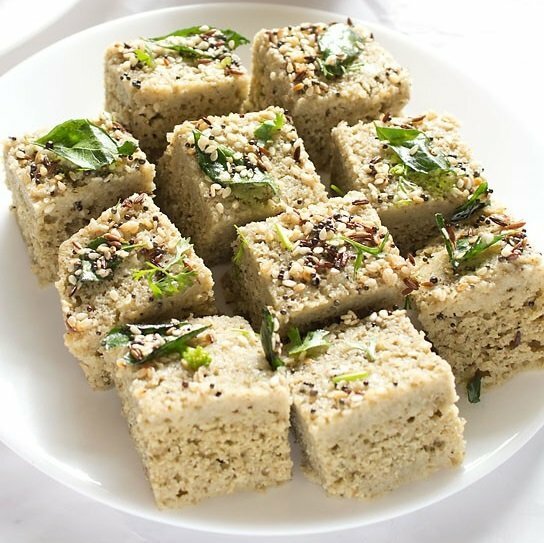 dal dhokla recipe with step by step photos – this is a healthy, tasty and nutritious moong dal dhokla recipe. 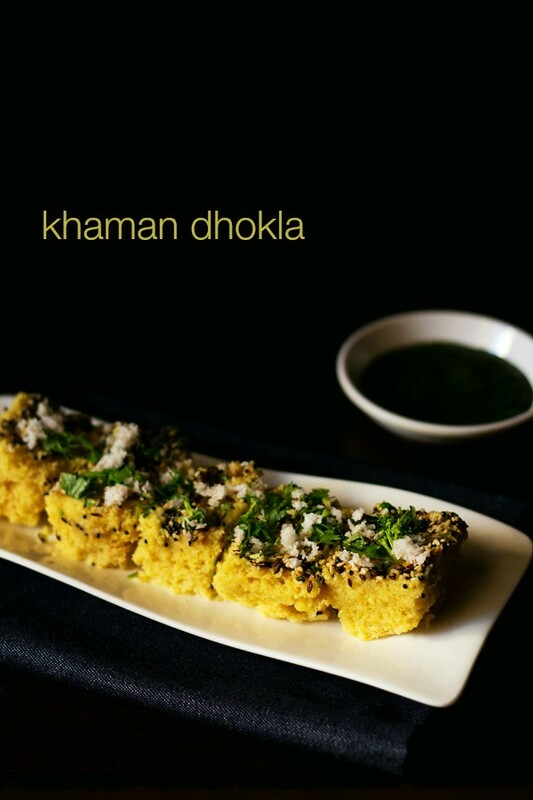 dhokla recipes have always been requested by the readers of the blog. when i saw this dal dhokla recipe made from whole moong beans in a cookbook “epicure’s vegetarian cuisines of india” by asha khatau, i liked it for its ease and of course health benefits. 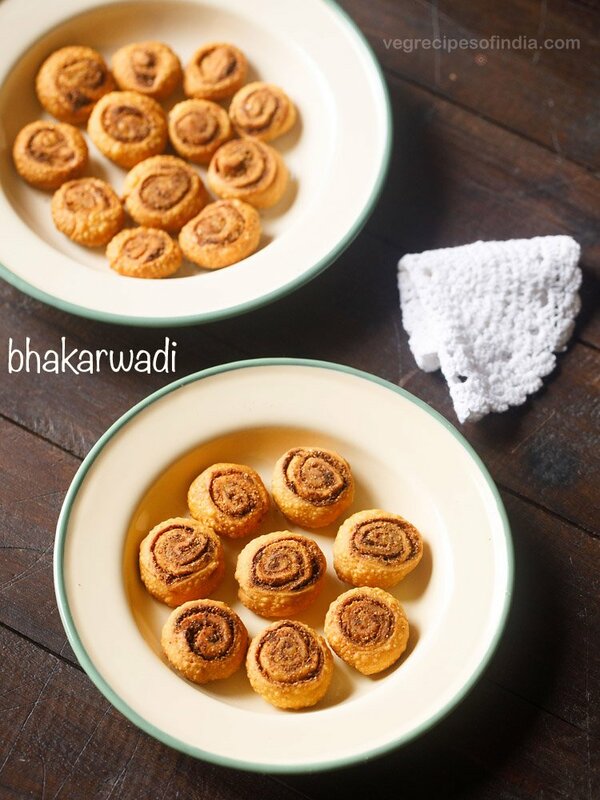 i made the dhokla and we would have these with our morning and evening tea. moreover what i liked about this moong dal dhokla recipe is that it is very easy to make and taste delicious. it also does not require yogurt (curd). 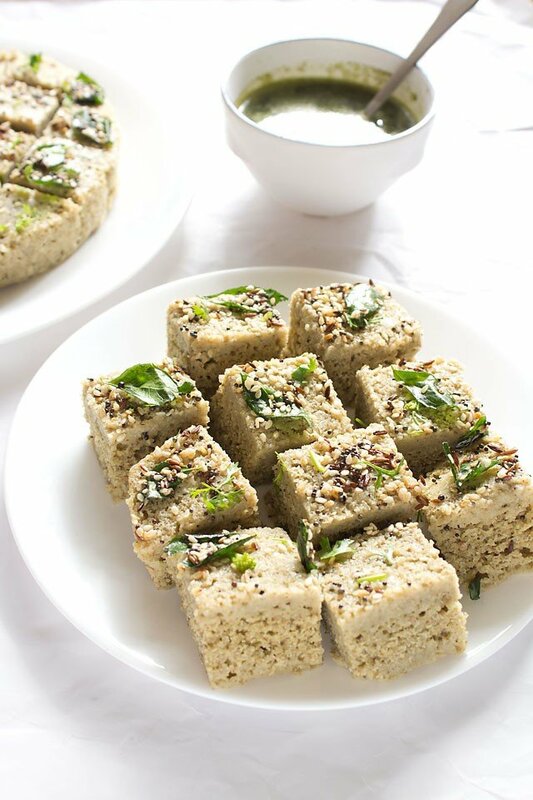 this dhokla has the typical moong bean taste and is savory and sour. it tastes sour like the idlis. so if you like idlis, you may also like this moong dal dhokla. i did not add sugar to the recipe. if you like a sweet taste, then you can add sugar to the dhokla mixture. 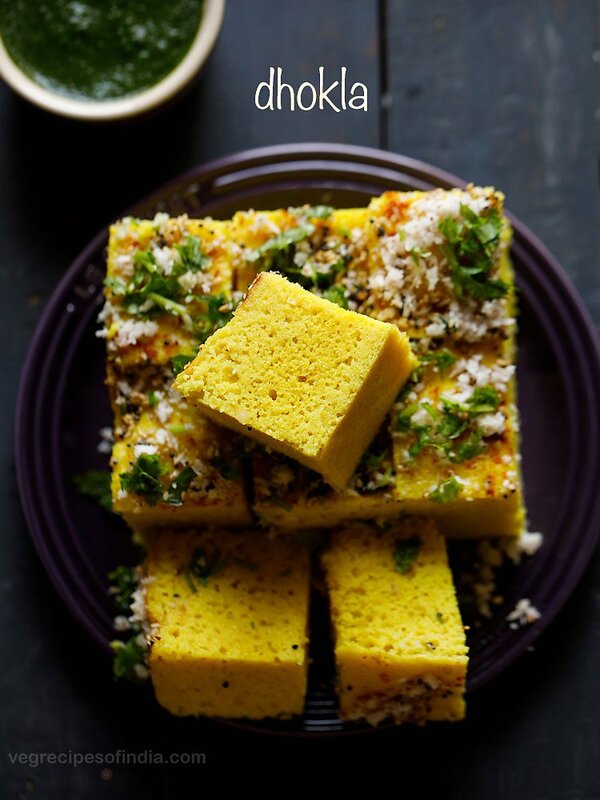 in fact this moong dal dhokla recipe is here to stay. i was skeptical first as i was not sure if the dhokla will break or will be perfectly round. i was amazed when it came out nicely from the pan. 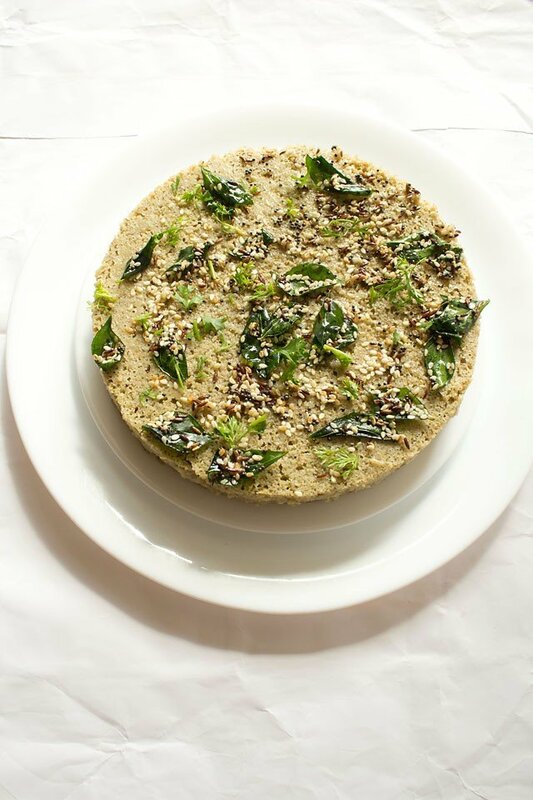 just for a more nutritive boost to the moong dal dhokla, i have also added roasted sesame seeds to the tempering. 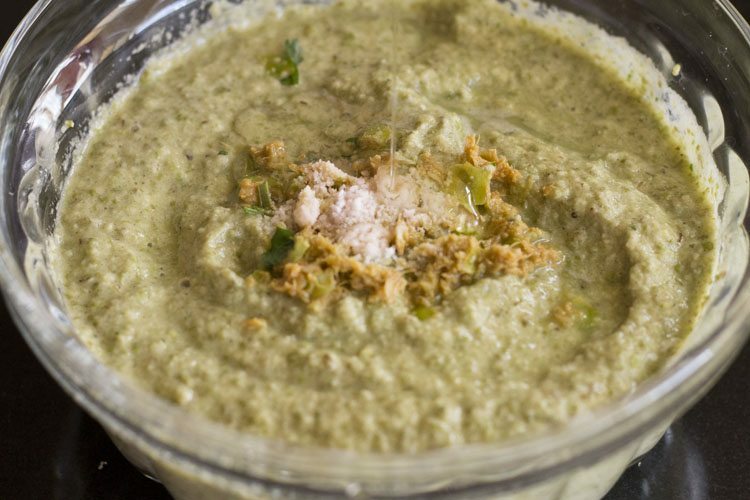 best accompaniment to moong dal dhokla is mint cilantro chutney or coconut chutney. 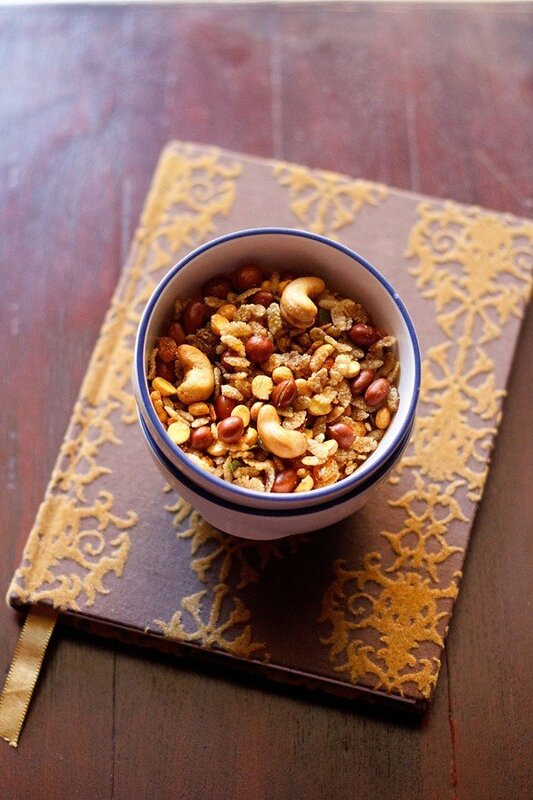 also it can go well with raw papaya chutney or tamarind dates chutney. 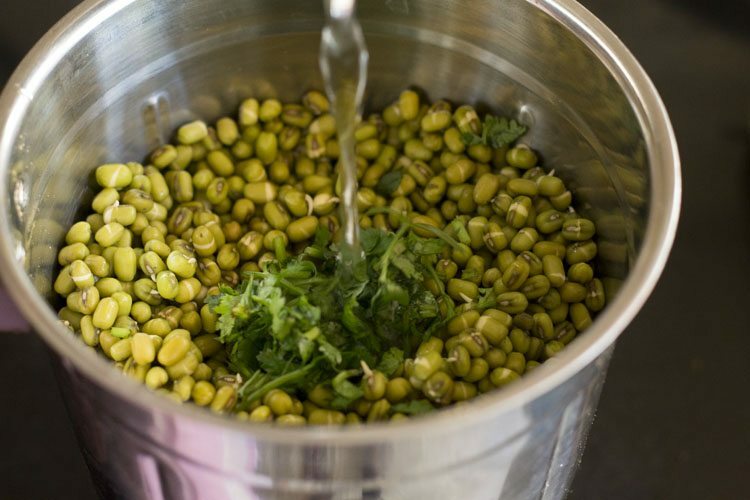 pick and rinse the whole moong beans with water for a couple of times. 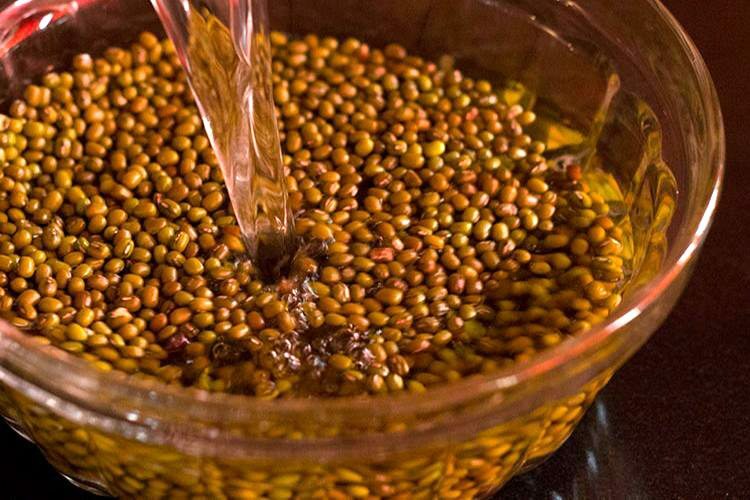 soak the moong beans in enough water for 6 to 7 hours or overnight. then drain the water. 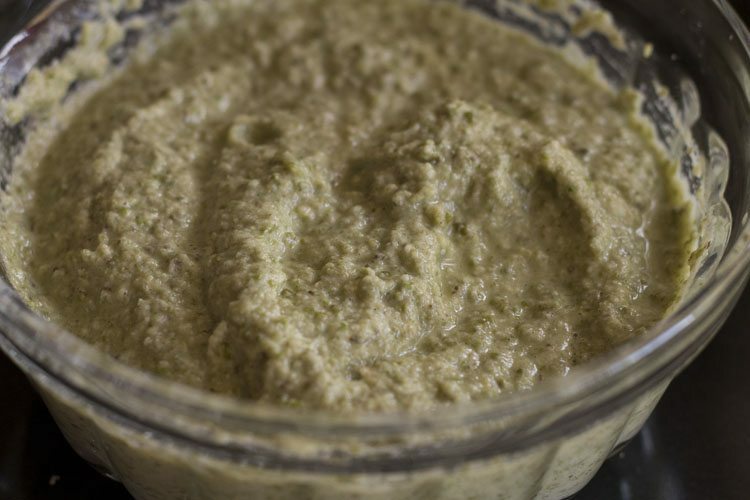 grind the soaked moong with coriander leaves and very ½ cup water to a semi coarse paste. don't make the paste too fine. also the batter should not be too thick nor thin but like a dhokla batter. meanwhile heat about 2 to 2.5 cups water in a large pan and let it come to a boil. grease a round pan with some oil. 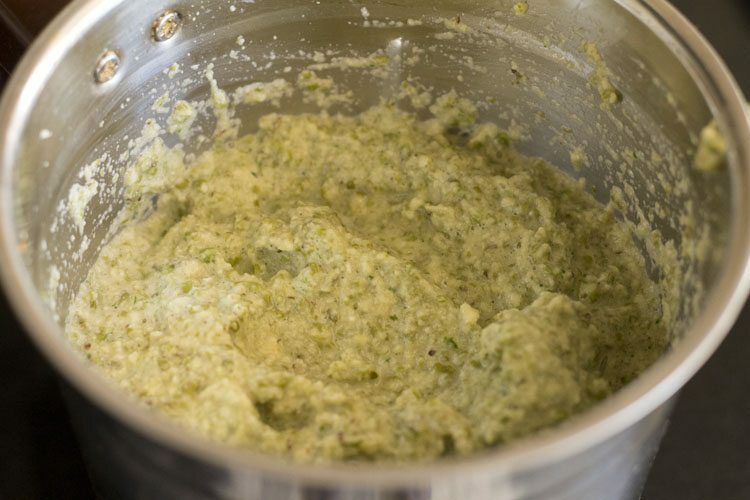 add ginger-green chili paste, oil, lemon juice and salt to the ground moong mixture and mix well. finally add fruit salt or eno to the dhokla mixture and mix very well. immediately pour this in the greased pan. place the pan in the large pan where the water must have already started boiling by now. cover the pan and steam for 12 to 15 minutes or till the dhokla is done. let the dhokla become warm and then you can remove it from the pan. then add cumin seeds and brown them. 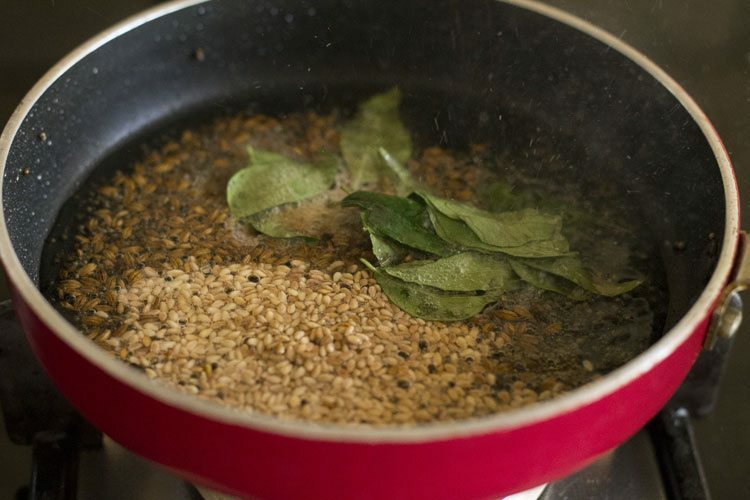 add asafoetida, curry leaves and roasted sesame seeds. mix well. then add 2 tablespoons water to the tempering. mix well again and let this mixture come to a boil. be careful when adding water. 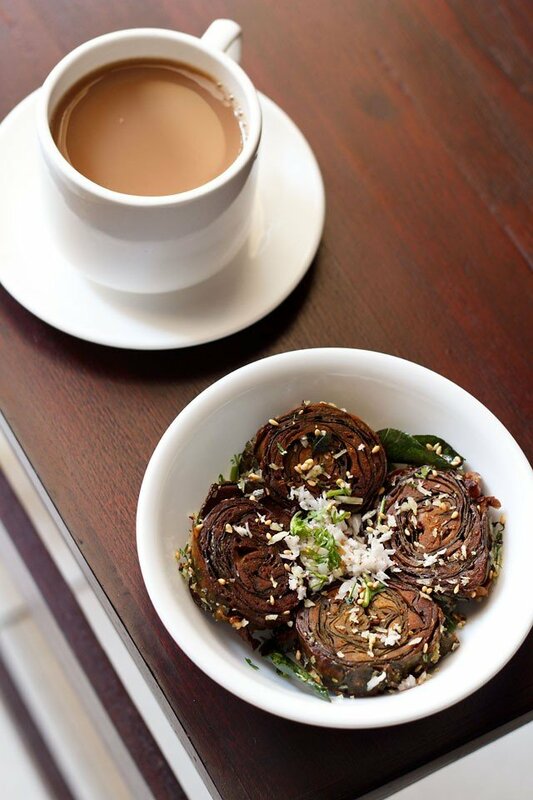 pour this tempering all over the steamed moong dal dhokla. garnish moong dal dhokla with coriander leaves and coconut. 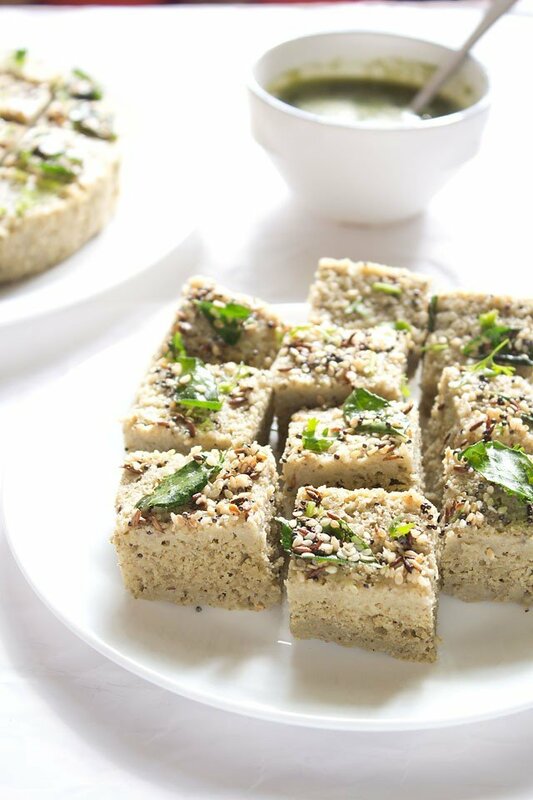 serve moong dal dhokla warm with mint coriander chutney. instead of steaming you can also microwave the dhoklas. just keep an eye when microwaving so that the moong dal dhokla does not become too dry or dense. 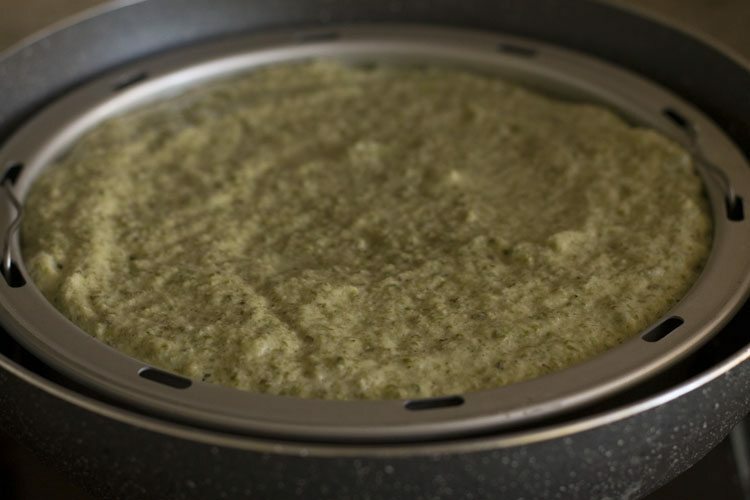 the dhokla can also be steamed in a pressure cooker. heat water in the pressure cake till it begins to boil. place the dhokla tin. 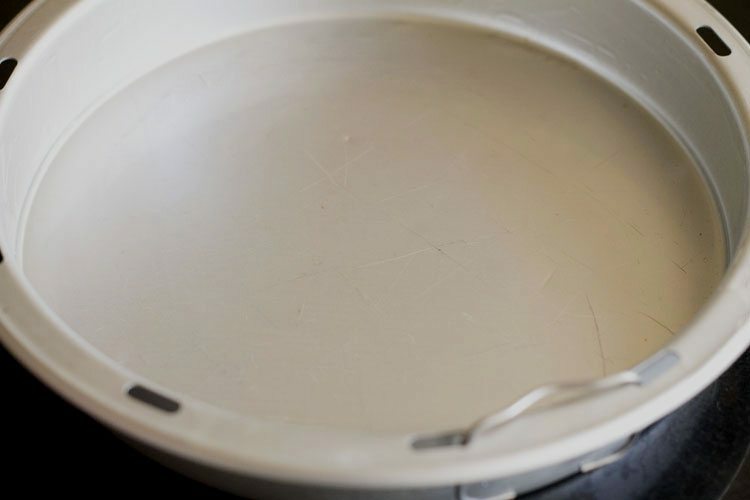 cover the pressure cooker with the lid and remove its whistle/vent weight. steam for some 12-15 minutes till the moong dal dhokla is done. 1. rinse 1 cup whole moong beans with water a couple of times. 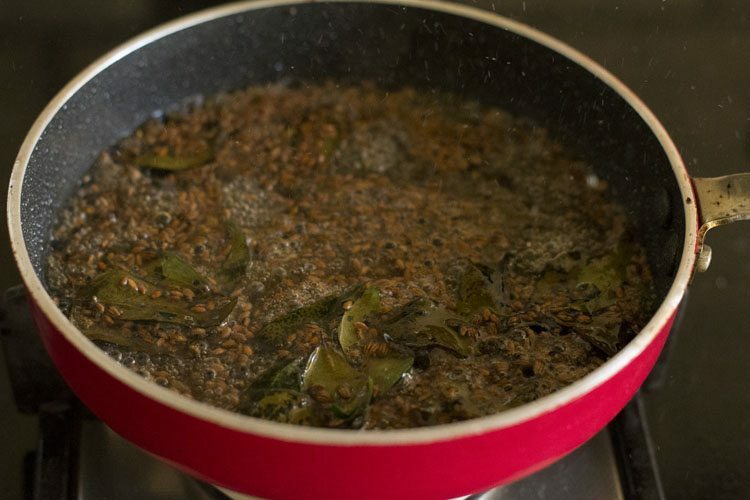 2. soak the moong beans in enough water for 6 to 7 hours or overnight. 3. later drain all the water. add the moong beans in a grinder jar. 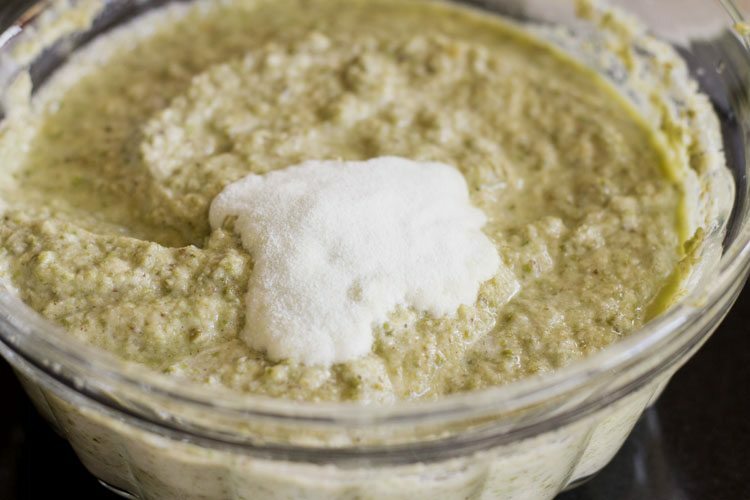 also add 1 tablespoon coriander leaves (chopped) and ½ cup water. 4. grind to a semi coarse paste. don’t make the paste too fine. 5. also the batter should not be too thick nor thin but like a dhokla batter. remove the moong dal dhokla batter in a mixing bowl or vessel. 6. meanwhile in a large pan heat about 2 to 2.5 cups water and let it come to a boil. 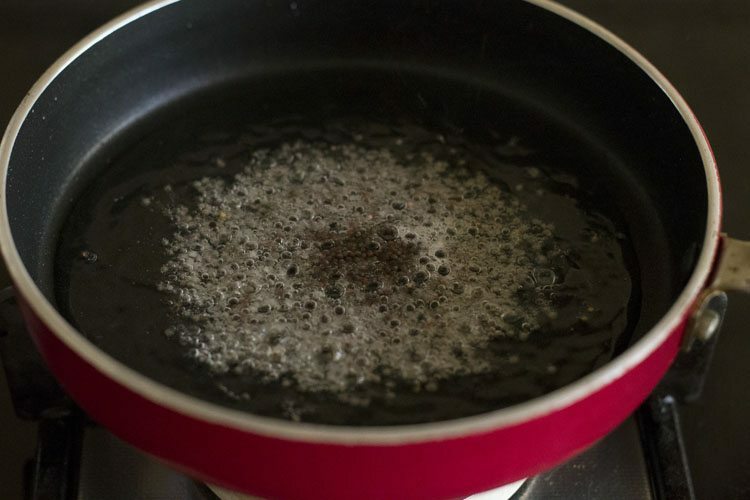 7. grease a pan with some oil. 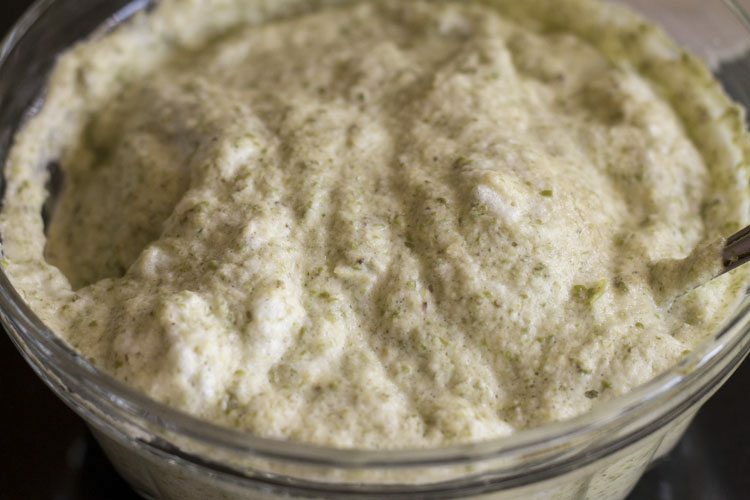 8. add 1 tablespoon ginger-green chili paste to the dhokla batter. 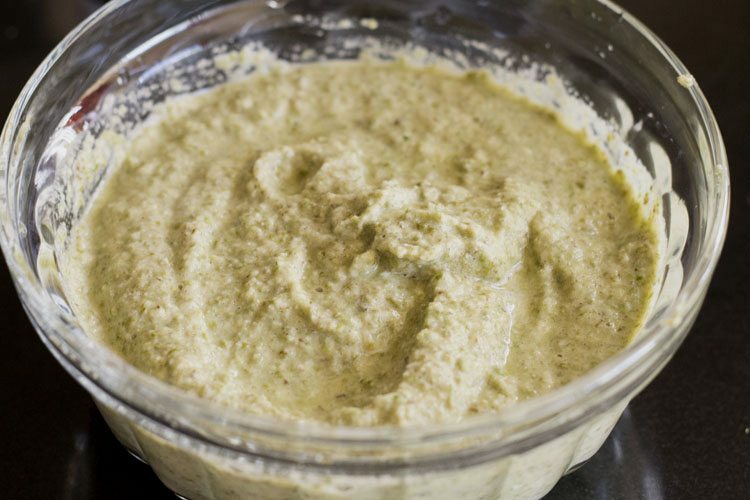 9. next add 1 tablespoon oil, 1 tablespoon lemon juice and salt as required. 11. then add 1 teaspoon fruit salt or eno to the dhokla mixture. 12. mix very well again. 13. immediately pour this dhokla mixture in the greased pan. 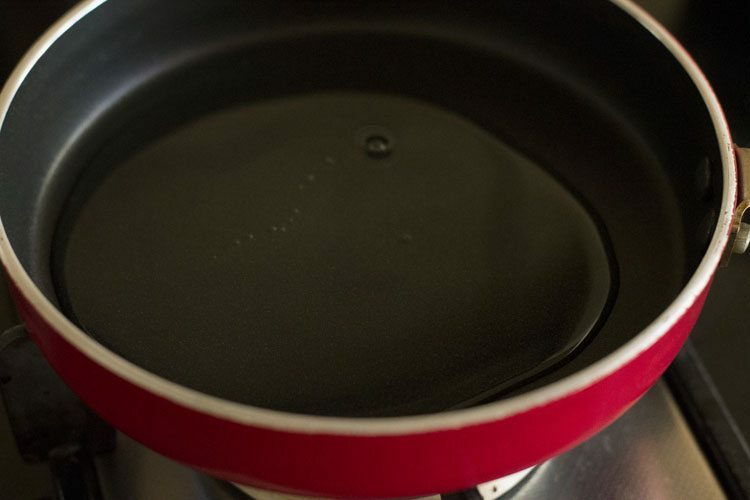 14. keep a metal stand in the pan with boiling water. 15. place the pan in the large pan where the water must have already started boiling by now. ensure the water level is below the pan else water might enter the batter. 16. cover the pan and steam for 12 to 15 minutes on medium flame till the dhokla is done. check with toothpick and there should be no sticky batter on the toothpick. 17. let the moong dal dhokla become warm. then remove the dhokla from the pan. 18. measure and keep all the ingredients ready for making tempering. 19. in a small pan, heat 1 to 2 tablespoons oil. 20. add ½ teaspoon mustard seeds (rai) and let them splutter. 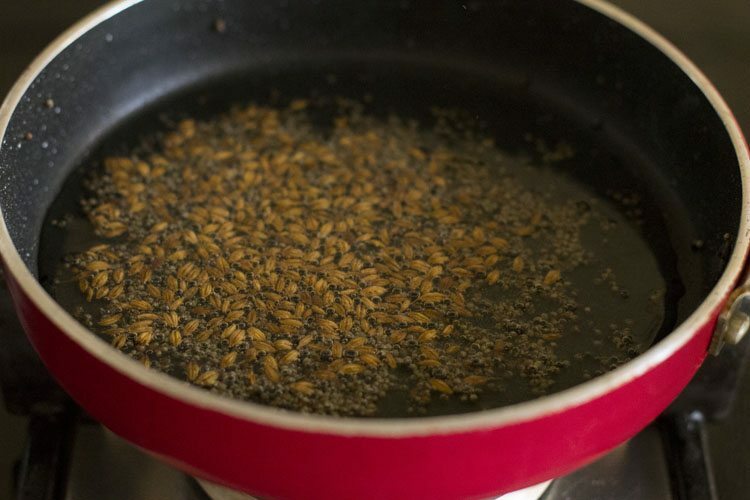 21. then add ½ teaspoon cumin seeds (jeera) and brown them. 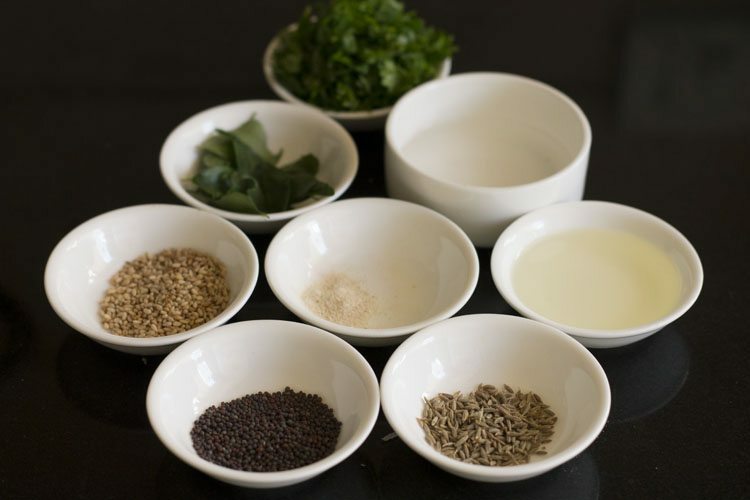 22. add 1 pinch asafoetida (hing), 1 sprig curry leaves (kadi patta) and 1 teaspoon roasted sesame seeds (bhuna hua til). mix well. 23. add 2 tablespoons water to the tempering. mix well and let the water come to a boil. be careful when adding water. 24. when the water comes to a boil, then pour this tempering mixture over the steamed moong dal dhokla. garnish moong dal dhokla with ¼ cup coriander leaves (finely chopped) and ¼ cup grated coconut (optional). 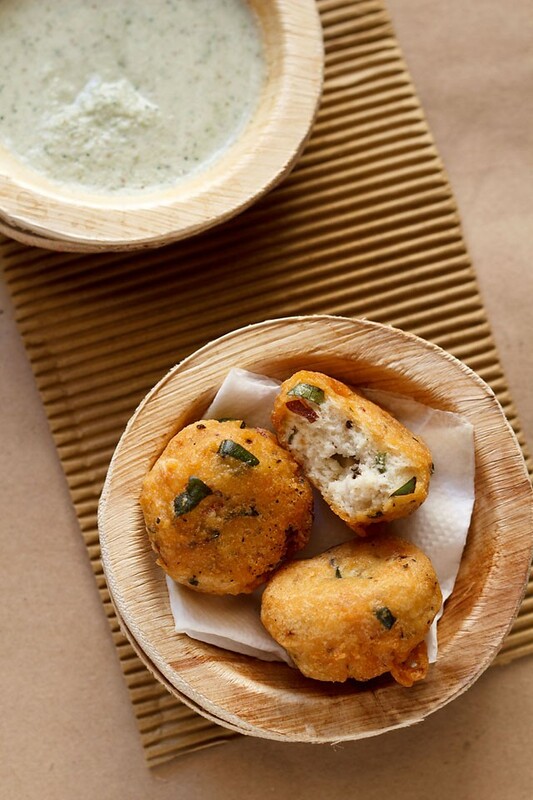 25. serve moong dal dhokla warm with coriander chutney or pudina chutney or coconut chutney. 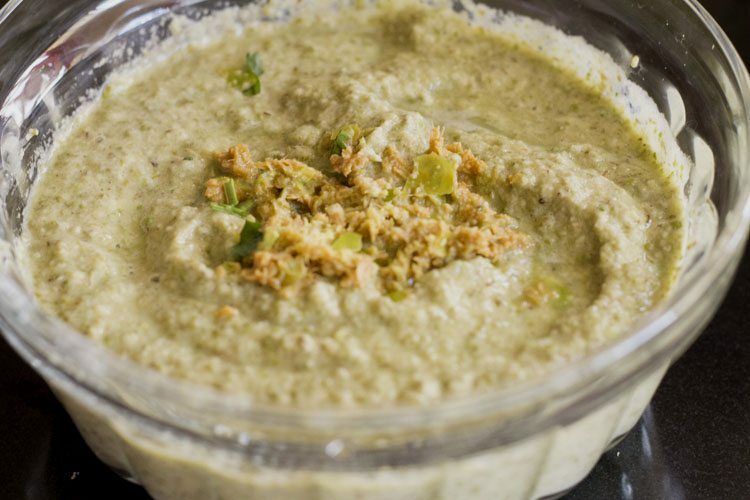 hi dassana, thank you so much for your wonderful recipe collection and detailed instructions. it’s opened up whole new worlds of cooking for me. it’s like culinary school for the home cook. 🙂 truly amazing effort. if i may, could i please request a handvo recipe? i tried it in india, and it was delicious. i would really prefer a simpler recipe which can be made at home without special implements such as a handvo cooker. i do have an indian style pressure cooker, tava and stainless steel idli maker (not sure if this would be any help). Love u Dassana for such amazing recipes. thanks kanchan for your sweet words and prayers. 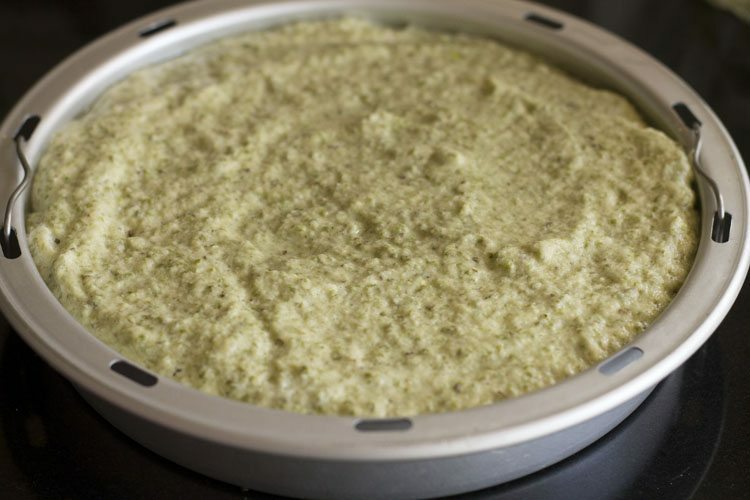 May I pour the batter into an idli cooker to prepare dhokla? I am ok with Idli shaped Dhokla..
jaya, yes you can do this to make idli shaped dhoklas. Also Favourites get lost once the app is closed. smita, we will check it. which phone you are using and which app – android or apple. let me know. i am using android app and in my app the favorites are saved even after closing the app. thankyou smita glad you liked the app any suggestions are welcome. yes, you may add a pinch of turmeric and you are welcome. 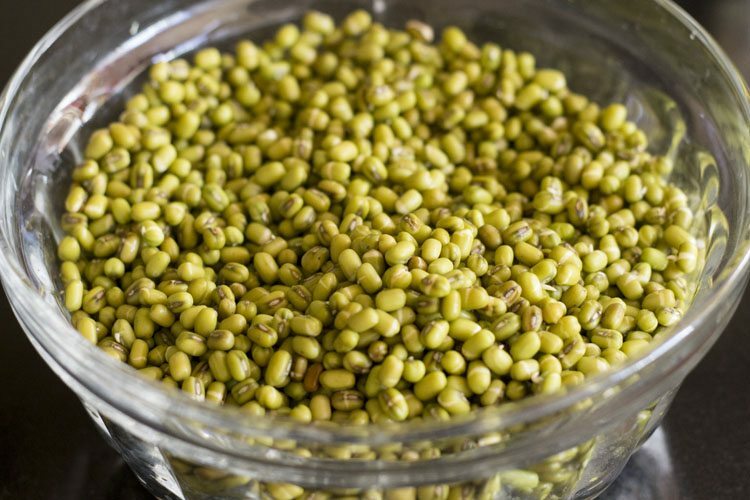 Can I use split green moong dal instead of whole moong? yes suvidha, you can use split moong dal. Hi, ur website is awesome and most recipes turn out awesome. For the first time one of ur recipes did not work for me. I tried this recipe in a pressure cooker. It came out very watery and did not set. It was a gooey mess. Could you please tell me where I could have gone wrong. ( I used very little water for grinding. So mostly that wasn’t the issue). Thanks a lot. thanks uday. i think what has happened is that you have pressure cooked the dhokla. it has be to steamed like we steam idlis in a pressure cooker. the vent weight/whistle has to be removed from the lid. the lid has to be secured tightly around the cooker. 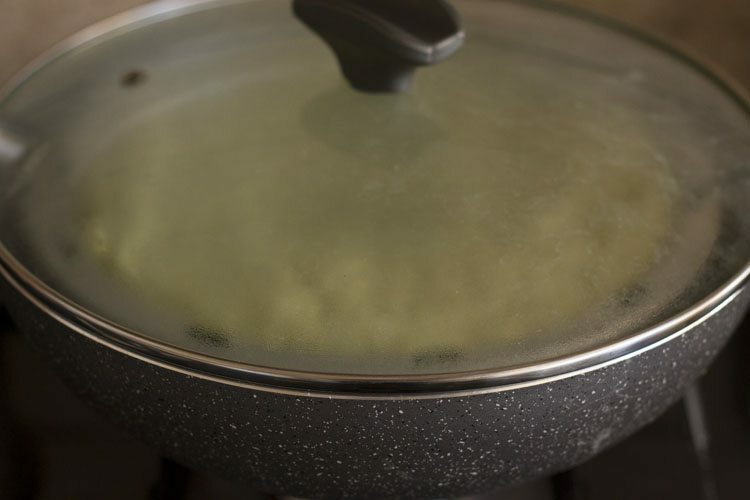 the steam passes through the vent and no pressure or steam is formed inside the cooker. some water has to be added inside the cooker. on a low to medium flame, the dhokla has to be steamed till set. 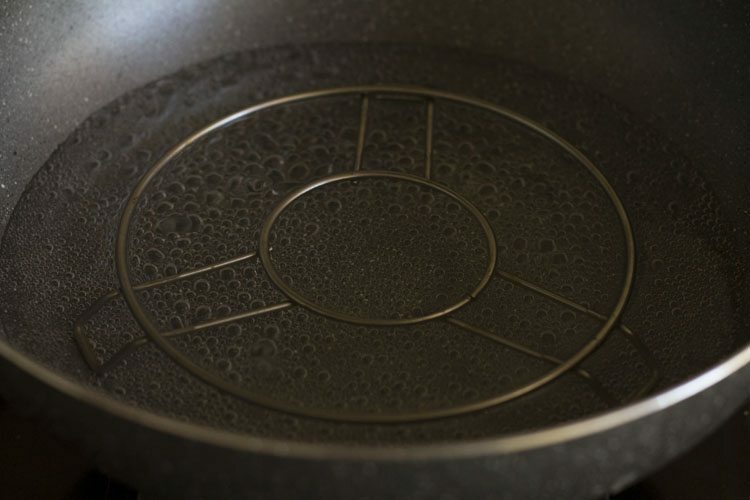 another issue that can happen, if you follow this method is that the water has to just cover 0.5 to 1 inch of the pan. this also depends on the size, depth of the pan. 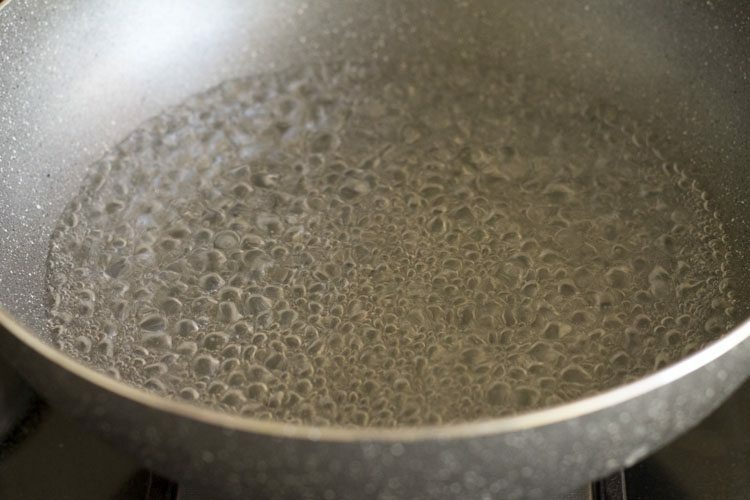 while heating the water should not bubble and fall in the batter. this will also lead to the batter becoming more liquidy than what it was. Thanks dassana . I did not use a weight, but maybe the problem was with the water levels. I will try again. Thanks a lot again for your wonderful recipes and easy to understand layout. Could you please add some more recipes that could be made using a microwave, especially baking stuff. Thanks. fine 🙂 then it must be the water levels. it has happened with me too with an electric cooker. once i made idlis and in hurry i added extra water. the idlis were all soft and had become mushy. i do not add microwave recipes as i hardly use microwave for making any dish. but let me see. i will try. Thanks DK ji for sharing this positive and motivating feedback. Glad to read your kind words. Excellent … Co incidentally my friend shared it with me last week, I tried its beautiful. Nutritious too. Expecting more such recipe. thanks vidya for sharing positive feedback. I owe a gratitude to u.. i have tried many recipes of urs including this dhokla. And trust me they all have come out so well. everybdy loved it.. i enjoy cooking ur recipes cause of its simple and perfect explanation. even the things i know how to make, i go through ur recipe first for any variation that i can make. Thank u so much. God bless u.
thanks bhavana for sharing your positive experience. i am touched to know that you trust my recipes so much. once again thanks for your blessings and kind words. i haven’t tried it yet but ur recipe looks yuummmyyyy!!!!!! i am sure i wil try it………..